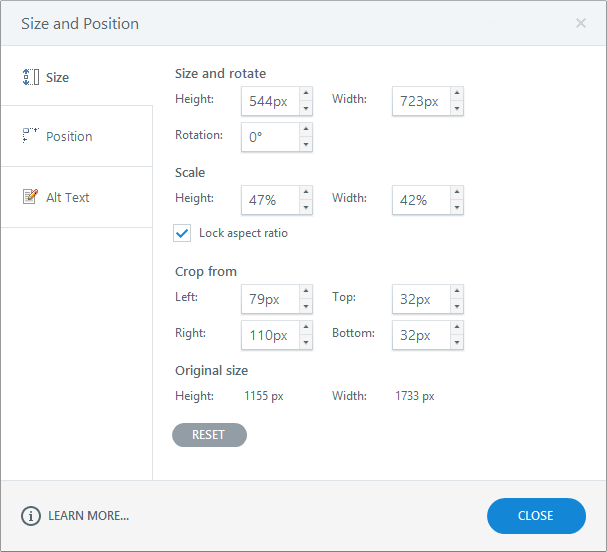 The Size and Position window lets you control an object’s height, width, rotation, scale, crop, and location. It's also where you enter alternative text, which is important for learners who rely on screen readers. Select the object you want to customize, then use any of the following methods to access the Size and Position window. Although it's easy to move an object on your slide just by dragging it, sometimes you might need more control over its exact position. Use the Horizontal and Vertical fields to enter a pixel value. Use the From selectors to choose a relative location. Use the Alt Text tab to set accessibility options that affect screen readers and keyboard navigation. Object is visible to accessibility tools: This box is marked for all objects by default. Uncheck it if you'd prefer that the selected object not be detected by screen readers and keyboard navigation. For example, if you have objects on the slide that don't contribute to the content's meaning, such as aesthetic elements (rectangles, lines, etc. ), it's a good idea to uncheck this box for those objects. For more information on Storyline's accessibility support, see this article.